Even if your New Year’s resolution fell through the cracks, it’s not too late to join our mid-year Resolution Reset Challenge. In January, we invited our members to take a 30-Day Debt Loss Challenge to kick off their New Year’s resolutions. We were overwhelmed by the response. Nearly 30,000 members took the challenge, and more than half reduced their debt by about $1,280 on average after only one month of joining the challenge. While this was amazing to see, a recent Credit Karma survey, conducted online by The Harris Poll, looked at 2,015 people in the U.S. and found that over 3 in 5 (61%) made New Year’s resolutions this year. Of that group, 70% did not stick to all of their resolutions. And of those who made resolutions involving finances, more than 2 in 5 (41%) didn’t completely follow through with them. If that describes you, there’s no reason to hang your head. Life happens. We’ve all been there. To help you pick up where you left off with your financial-fitness resolutions, Credit Karma is launching a 30-Day Resolution Reset Challenge — designed to help you develop money-saving habits that could spur you on to reaching your financial goals in the second half of the year. Here are a few ideas to get you (re)started on your path toward financial progress. Don't forget to join the Resolution Reset Facebook Group to stay motivated! Air conditioners can become clogged with debris over time, limiting their efficiency, but if you keep it clean and replace filters as scheduled, it might help cool down your home and lower your electric bill. Summer can be great time to bike to work. Not only is it good exercise and a great way to enjoy a beautiful day, but it could also be a money-saver. Challenge yourself to bike as much as possible over the next 28 days (even on the weekend), to find out how much money you can save on gas or ride-shares. If you don’t own a bicycle, see if your city has a bike share program you can participate in. Here are a few. Bonus tip: If you can’t bike to work, consider taking public transportation or starting a carpool group with your co-workers. Gas prices can go up in the summer, which makes it a great idea for you to download a fuel finder app, like GasBuddy or AAA Mobile, to search for the lowest prices near you. Bonus tip: In 2017, GasBuddy claimed you could save money in many states by filling up on Mondays. And by that, we mean say yes to everything that doesn’t cost you money. Invite your friends and family to join in on a fun day of freebie activities. You could say yes to outdoor activities at the park or yes to taking a walk around your neighborhood. If you have kids, you could say yes to them wearing their pajamas all day or yes to ice cream for breakfast (as long as it’s the sort of ice cream you already have in your refrigerator). Saying yes can open up your day to some fun (and cheap!) activities you might not normally consider. Now that the sun’s out later in the day, try exercising after work while it’s still light out. Call your gym to ask about freezing your membership for a couple of months. Make sure to also ask if there are any fees associated with freezing your account. Some gyms only charge a small monthly fee (we’ve seen them at $10–$30) to let you keep your membership, which could really save you some cash in the long run, depending on your monthly gym costs. Cool off this summer by making some of your own frozen treats. Search the internet for easy, inexpensive ice cream or frozen yogurt recipes, or make your own paletas! What’s a paleta, you ask? 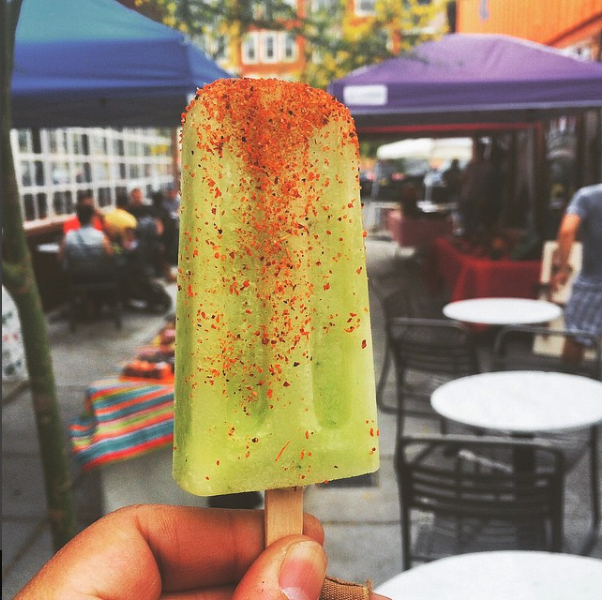 A paleta (pa-LEH-tah) is a Mexican-style ice pop, traditionally made with all-natural ingredients like fresh fruit and vegetables. Real chunks of fruit make paletas feel like summer on a stick, and making your own can be inexpensive and a great way to use up any fruit you brought home from the farmer’s market. Try out this homemade paleta recipe from Tasty Pants Paletas, a small company run by one of our Credit Karma editors. The cucumber-melon combination in this recipe may not be familiar to you, but it’s a light and refreshing combo that’ll cool you down during the hottest summer days. Honeydew is our favorite melon to use, but experiment with your favorites or with other fruit! Peel about ⅓ of the cucumber and dice. Add to a medium bowl. Dice enough melon to make ½ cup and add it to the diced cucumber. You should have a scant cup of fruit total. Toss the diced melon and cucumber with the lime zest and 1 Tbsp of lime juice. Distribute the diced fruit evenly among your popsicle molds and place the molds in the freezer. Cube the remaining unpeeled cucumber and add it to a blender along with the remaining chunks of melon. Add the rest of the lime juice to the blender, along with about ½ cup of water. Pulse and blend until liquefied. Over a large bowl, push the mixture through a sieve, using the back of a spoon to help press all the juice through, and discard any remaining pulp. You should be left without about 2 cups of juice. Taste the cucumber-melon juice for sweetness. If your fruit is very ripe or you’d prefer a no-added-sugar option, leave as is. If you’d like it sweeter, add cool simple syrup to taste, a couple of tablespoons at a time (it should be slightly sweeter than you’d like, as it will taste less sweet once frozen). Distribute the juice evenly among molds and insert popsicle sticks if you have a mold with a lid that holds sticks. Or freeze open molds for at least an hour and then insert your popsicle sticks. Freeze for at least four hours or until solid before unmolding. To unmold: run the mold under warm tap water for 15 seconds or so until paletas come out easily when you pull on the popsicle sticks. Start a garden in your backyard, or on your patio or balcony. While the up-front costs of a home garden can seem daunting, Amazon sells a variety of herb garden starter kits for under $25 — and your local garden supply store might have more affordable options, like vegetables and fruit that can be grown in inexpensive containers. Bonus tip: If you don’t have a patio or backyard, look for a community garden you can join. Or consider signing up for a delivery service like Imperfect Produce, which sells discounted fruits and vegetables. Many museums have a day and time slotted for free admission. Houston, for example, offers free admission to several of its museums, like the Museum of Fine Arts and Buffalo Soldiers National Museum, during certain hours on Thursdays. Likewise, plenty of Seattle’s museums offer free days and times, including its Museum of History and Industry, which offers free hours every first Thursday. And check if museums near you offer free tickets for kids, which could help you save on a family outing. Bonus tip: Bank of America® credit or debit cardholders can also enjoy free museum days on the first full weekend of every month at select museums across the country. If you frequent your neighborhood laundromat, think of how many quarters you could save by skipping the dryer and hanging your clothes at home or on a clothes line. For example, if drying your laundry costs $1.50 and you do two loads a week, that’s $12 a month just spent on drying. If you do your laundry at home, you can save on your electric bill by powering down the dryer for the summer. And by line drying your clothes, you might extend the life and color of them, too — which could save you even more money in the long run by reducing the amount of new clothes you need to buy. Bonus tip: If you want to save on your water bill as well, consider buying a portable washing machine that is small enough to fit inside most apartments. They use less water and take up less space. Did line drying your clothes make you realize you have too many outfits? Go through your closet and find the clothes you don’t wear anymore. Sort them into “donate” and “sell” piles. You can take the donate pile to a local Goodwill or Salvation Army. Bonus tip: Maybe you’ll be able to claim the donation as a charitable deduction on your taxes. Just make sure you ask for a donation receipt that estimates the value of the clothes you contributed. Now take a look at the “sell” pile you made. Start by taking pictures of these clothes and listing them on websites like Poshmark, eBay or Craigslist. You could also host a yard sale. Bonus tip: Pay your credit card or other debts with the money you earn from selling your clothes. See if they’re offering any cost-savings promotions this summer. In some cities, like Seattle and Washington, D.C., low-income residents may be eligible for utility discounts. Get support from other challenge participants by joining the Resolution Reset Facebook Group! Planning a summer vacation? Imagine how much money you could save by camping at a nearby national or state park instead of a far-off vacation to Europe or Asia. You could save yourself hundreds of dollars and maybe a lot more by choosing to camp instead of traveling abroad. Here’s a breakdown. All of a sudden, the total cost for a six-day trip abroad is looking like at least $1,000 for yourself and a lot more if you’re bringing company. And that doesn’t include meals or activities. By choosing a six-day camping trip instead, you could cut your costs by half and probably a lot more. Let’s say you spend $50 in gas, depending on your destination, and $25 per night for a camping spot. Toss in a generous $500 for any major camping gear you may not already have, like a tent and sleeping bags, and you’re starting with around $325 in savings for yourself, much more if you’re taking the whole crew and if you already have camping gear. And if you’ve still got the itch to go abroad, there are plenty of tips for doing it on the cheap — here are a few of our own. You’re halfway through the challenge! Now try following this rule for the next 15 days. Every time you skip your morning coffee or make food at home instead of eating out, estimate how much you would have spent if you’d bought that latte or burger. Move the money you think you saved from your checking to your savings account. You could also save money by going to free music shows instead of paying anywhere from $25 to $70 or more for a single concert ticket. Tickets to Minor League baseball games are usually cheaper than those for Major League games, and many ball clubs offer special promotions and discounts during the summer. You can find your local Triple-A team’s schedule here — see if its holding any fun promotions for upcoming games. For example, the Charlotte Knights, the White Sox affiliate, has hosted events like “Space Jam” night. Promo nights can be a lot of fun, with the teams sometimes wearing special jerseys and offering themed giveaways. If your travel aspirations are too big for a camping trip and you want to take that trip across the world, a travel rewards card that offers a large sign-up bonus and points or miles for every dollar you spend could help you save money on your next adventure — just make sure the spending required to earn the sign-up bonus is within your budget. Some banks (like Bank of America and Chime) feature change-saving programs that can supercharge your savings. When you pay with your debit card, the bank rounds up the purchase amount to the nearest dollar and puts the difference into your savings account. It’s small, but it can add up over time. You won’t have to remind yourself to make those little savings decisions here and there — it’ll just happen. Call your bank or go online to find out what’s available. Did you know your Costco membership can get you discounted movie tickets for AMC, Regal Entertainment and Cinemark theaters, along with sporting event tickets, restaurant gift cards, and theme- and water-park passes? Tickets at the AMC River East 21 in Chicago can set you back more than $18 each, while tickets at the AMC Metreon 16 in San Francisco cost upward of $20. With bundles of 10 AMC movie tickets starting as low as $89.99 via Costco’s website, you could save more than $100 over the course of the summer by buying your tickets through Costco ahead of time. Just make sure your pre-purchased tickets will be valid for your favorite movie theater. Do you have any leftover clothes or accessories that weren’t donated or sold? Organize a pop-up clothing swap with your friends. Here’s how it works: Invite friends over to your place and tell them to bring clothes and accessories they don’t wear anymore. Arrange all items so they’re easy to see, and then, go shopping! Not only will this help refresh everyone’s closets, but it will also help save money that you otherwise might have spent on new clothes. It’s Week 3 and you’ve been saving. Now might be a great time to build on your resolutions by opening a high-yield savings account. These bank accounts typically have higher interest rates on your savings than traditional savings or interest-earning checking accounts. The national average for savings accounts as of June 2018 is a measly 0.08%, according to the FDIC, but a handful of banks offer much, much more. Here are a few rates as of June 2018. When the weather’s nice, many cities offer free movies in the park. Check out some examples below, then go online to find out what movie events your own city might offer. “Black Panther” is also playing for free in Washington, D.C.
Head over to your local public library for some peace and quiet. Not only will you find books to borrow for free, but the more time you spend at the library, the more money you could save on utilities by turning off the air conditioning while you’re not home. Bonus tip: If you want to take your savings a step further, you could cancel your home internet service and go to the library when you need to surf the web (or use your phone instead, especially if you have an unlimited data plan). On top of borrowing from your local public library, you’ve got some other free-read options. Instead of shelling out $15 or more for the latest book this summer, read it online for free. Amazon Prime® members have access to more than 1,000 free books and magazines through Prime Reading. You could also check out reading apps like Overdrive to borrow audio and eBooks, or see if your community has a Little Free Library. The next time it’s nice outside, go on a camping trip in your own backyard. This can be cooler (and much cheaper) than blasting the air conditioning on a hot summer night. Bonus tip: If you don’t have a backyard, try turning off the air conditioner and using a fan instead. Or maybe open the windows to get a good breeze going. Instead of cooking in your kitchen (and dealing with the associated utility costs), invite your friends over for a backyard barbecue or a picnic at a nearby park. And maybe ask everyone to pitch in a little money for gas or coal for the grill, or make it a potluck and ask for volunteers to bring some of the items. While you’re out, turn off your air conditioner (or set it a few degrees warmer). And don’t forget to close the windows and draw your blinds to keep the cool air in and the hot sun out. The average consumer spends about 33 cents an hour to run central air through their home, compared to 20 cents an hour for a window air conditioner, according to Silicon Valley Power. So if you turn your air conditioner off for three hours each day, you could save between $18 and $30 per month. Instead of spending a fortune on a trip around the world (or even across the country), discover the charm of exploring nearby sights and landmarks during a “staycation.” Be sure to look for locals-only discounts around your city, too. You might find you get cheaper prices or even free entry at your local museum, zoo, botanical garden or aquarium — just for living in a nearby ZIP code. Bonus tip: Don’t be afraid to venture outside your city and explore other tourist attractions within driving distance. That’s probably still cheaper than flying to a vacation spot. You could even use the money you save this summer by staycation-ing to put toward a future dream vacation. Many summer activities might require driving into the city for downtown events, parades or other city gatherings. Finding a parking spot in a busy city can stress out even the calmest drivers — especially if you have to parallel park to fit into a tight space. Next time you head downtown, consider an app like SpotHero to reserve your parking spot ahead of time. It can be more convenient, and also tends to be cheaper than paying a premium for garage parking. If you stumble across a better spot for free, you can cancel your reservation before it begins and receive a full refund. Stay motivated by joining the Resolution Reset Facebook Group! Shopping for back-to-school items is no joke. If you’re looking to save money on laptops, backpacks, school clothes, notepads and pencils, check online to see if your state offers a sales-tax-free holiday. They usually happen toward the end of the summer. Bonus tip: If your state doesn’t offer sales-tax-free days, consider signing up for email newsletters at back-to-school stores like Walmart and Target, so you’ll be the first to hear about any special promotions. Day 31 (bonus day): Time to take stock and celebrate! Congrats — you’ve completed the 30-day Resolution Reset Challenge! Take some time to rejoice and crunch some numbers. Now that you’ve reset those financial-fitness resolutions, you can easily stick with these money-saving tips in the weeks and months (and half year!) ahead. And if you’re ready to make any of them part of your regular routine, think about adding them to your calendar on your phone or computer, and set alerts so that you’re reminded to keep doing them. Remember, you have the rest of the year (and beyond) to work toward financial progress, and Credit Karma will be with you every step of the way. This survey was conducted online within the U.S. by The Harris Poll on behalf of Credit Karma from June 19-21, 2018 among 2,015 U.S. adults ages 18 and older, among whom 1,254 made 2018 New Year’s resolutions. This online survey is not based on a probability sample and therefore no estimate of theoretical sampling error can be calculated. For complete survey methodology, including weighting variables and subgroup sample sizes, please contact media@creditkarma.com.